Absolutely fell in love with this new stamp set from Penny Black!!! I barely get this one inked and now I am seeing sneaks on their Facebook page of new goodies coming out. 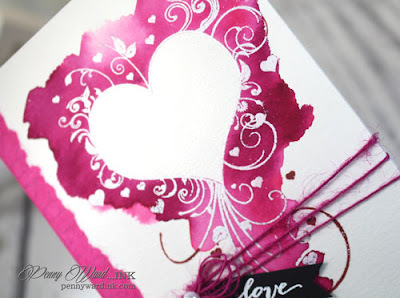 Masked the heart on watercolor paper, then added all the pretty pinks and reds. 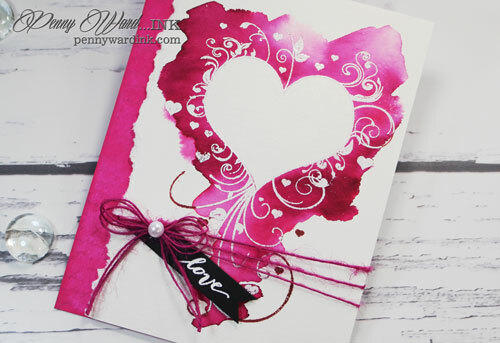 Stamped and heat embossed the swirly heart with white powder. What you can't see is that I added Sheer Shimmer Spritz (painted on) to the white heart. The edge was torn and adhered to a piece of cardstock that was inked and stamped. 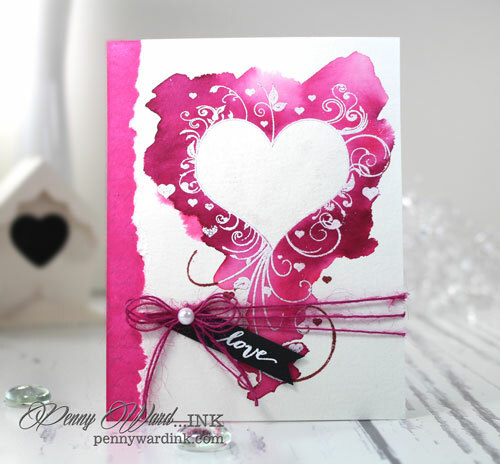 Another beautiful card, Penny. I am just starting my collection of Peerless Watercolors, and I am wondering if you could share the colors you used on this card? You have found the perfect Valentine color combo. Thank you for your help. That is soooooo beautiful!!! Great Job!!!! Wow, wow, TRIPLE wow! I had to swing by and tell you what a stunning card this is! I have never seen anything quite like it and adore the way it is unique with the heart being white and the immediate background being pink. And those shades of pink are so dreamy! I love the rich colors here and the twine adds such great dimension. The love sentiment in black anchors this so perfectly and the whole thing is truly outstanding! Thanks so much for the inspiration and for sharing your talents with us for this week's Simon Says Stamp Monday Challenge!